I was listening to this classic and wonderfully mood-expressive song on the radio yesterday evening while cooking, when a lyric I had never noticed before leaped out at me – that the moon turned from blue to gold when the protagonist was no longer alone. Having been discussing the lonely side of blue in the previous post, I found this riveting. Messrs Rodgers and Hart must have felt that blue was a lonely colour too. 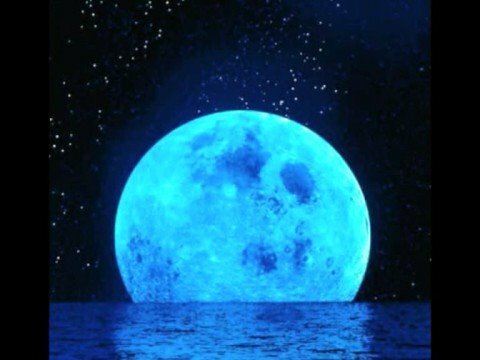 In case you are wondering, a Blue Moon is a second full moon in a calendar month – a very rare occurrence and even more rarely is the moon actually Blue. Hence the use of the phrase to describe something which rarely happens. The first known literary reference to the term occurs in a text of 1528 entitled “Rede me and Be nott wrothe, For I faye no thynge but troth.”, ‘wrothe’ meaning angry, and was intended as a diatribe against the ‘ambicion of the clergye’. ‘Yf they say the mone is belewe / We must believe that it is true’, indicated the clergy’s power to manipulate. Previous Post Are You feeling … purple … red … orange … or perhaps … Blue? Next Post THE BLACK SQUARE Dah … Dah … Darrh! I’ve always loved the idea of a blue moon – magical, mystical, watching over us all. And now you’ve had me singing this song out loud in my kitchen! From blue to gold – what a treasure. Makes me think of all that blue and gold you see mixed together in medieval/ Renaissance and pre-Raphaelite works…Each giving the other a special punch. Lovely Post Francesca. You should consider writing ……..
My husband Gary has just added Blue Moon to his repertoire. Thanks for sharing these insights and I will let him know about the “turning to gold” aspect!